James Hamilton (c.1710-1783, New York City), son of the well-known Philadelphia lawyer Andrew Hamilton, was a prominent lawyer and governmental figure in colonial Philadelphia and Pennsylvania. He served as Deputy Governor of the Province from 1748-1754 and then from 1759-1763. Nicholas Scull II (1687–1761) was an American surveyor and cartographer. 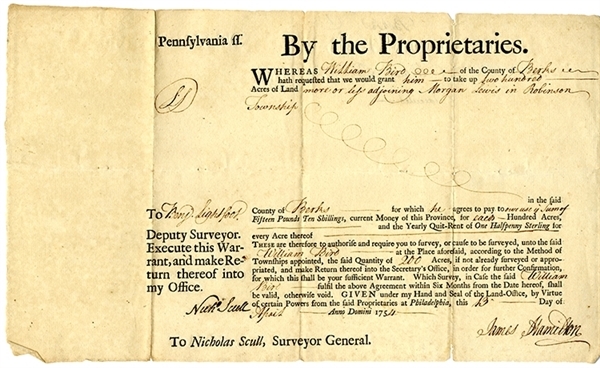 He served as the Surveyor General of Pennsylvania from 1748 until 1761.